Appearance: The human ear as seen in profile was often used symbolically in Egyptian art. Either the left or right ear was used; and unlike the Eye of Horus they both carried the same meaning. Meaning: Symbolic ears are relatively common in Egyptian art, especially in a class of reliefs called "ear-stelae." These stelae were dedicated to certain gods in appreciation for answered prayers or for present requests. 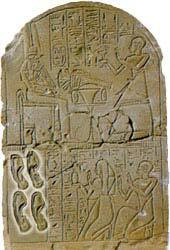 The stelae typically featured images of the god and the supplicant worshipping him. Above this scene or to the side would be chiseled several human ears. These ears were believed to aid the gods in hearing the prayers. Several of the gods were described as "great of hearing" or "of hearing ears". Deities described this way include Ptah, Amon, Horus, Isis, and Thoth. It was originally thought that these ear-stelae were requests for the healing of the deaf. However, comparable stelae featuring other body parts are not to be found and thus preclude such an interpretation. Interestingly, the ear is rarely featured in Egyptian art outside of the context of the ear-stelae. Occasionally though, it was featured alone as an amulet.